The Garden Museum – Dig Delve – An online magazine about gardens, landscape, growing & making. 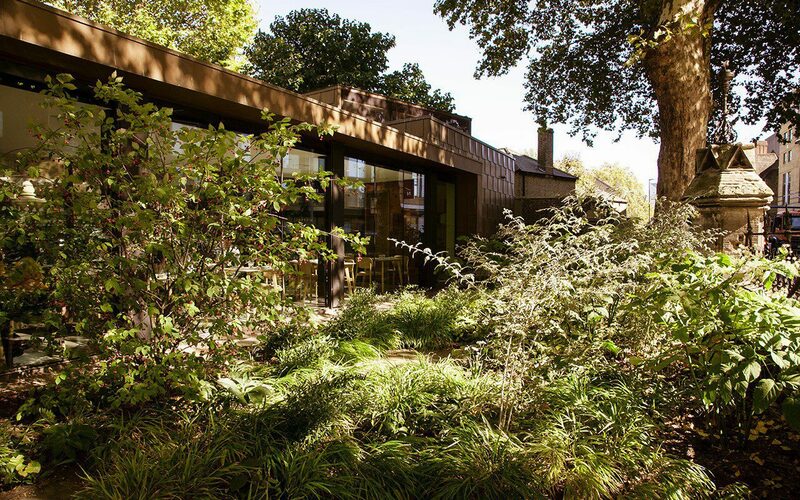 In 2015 I was approached to work as the landscape designer for a new extension at the Garden Museum. The renovations were extensive and it was the second phase of the project for Dow Jones Architects. The first, in 2008, had been to create a series of freestanding structures that moved lightly through the heritage building. This final push would see a new extension reaching out into the garden to create spaces for education, events and a new cafeteria. The plan for the extension sailed over the footprint of the old knot garden which previously occupied the site, to enclose a new courtyard where the tombs of the Tradescants (father and son) and Captain Bligh take centre stage. The achievements of these three men provided a strong brief for the garden, which reflects their pioneering spirit as adventurers, plant hunters and educators. 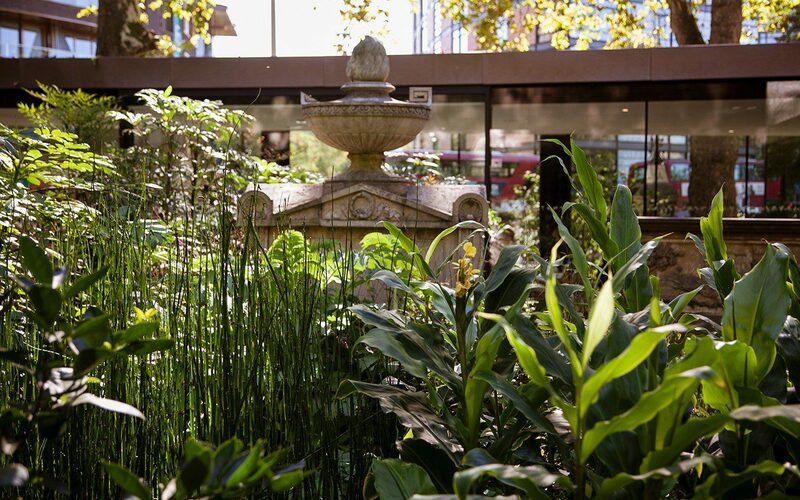 The Tradescants, once residents of Lambeth, had conceived their garden as a reflection of Eden and so the new cloister was also intended to be a place of sanctuary, where the seasons are brought into close perspective in the centre of the city and the planting is the focus of learning. We pondered for some time over the removal of the well-loved knot garden, which Lady Salisbury had designed for the museum in 1980, three years after it first opened as the Museum of Garden History. Initially we worked up a series of iterations to abstract the knot garden to see if its memory could be glimpsed in the new design, but the architecture required a more confident forward-looking approach to move the garden, with the museum, into a clearly defined, bold new chapter. However, drawing from the existing sense of place was also important, so the ledger stones from the old graveyard and the bricks from the knot garden were integrated into the path that creates a frame from which to look into the planting. In the corner, where the tombs were close to the path, we extended its reach to allow closer observation of the detailed carvings and inscriptions. An old mulberry and an arbutus were retained in the new design, while an old fig and medlar were carefully moved to beds at the other end of the church. 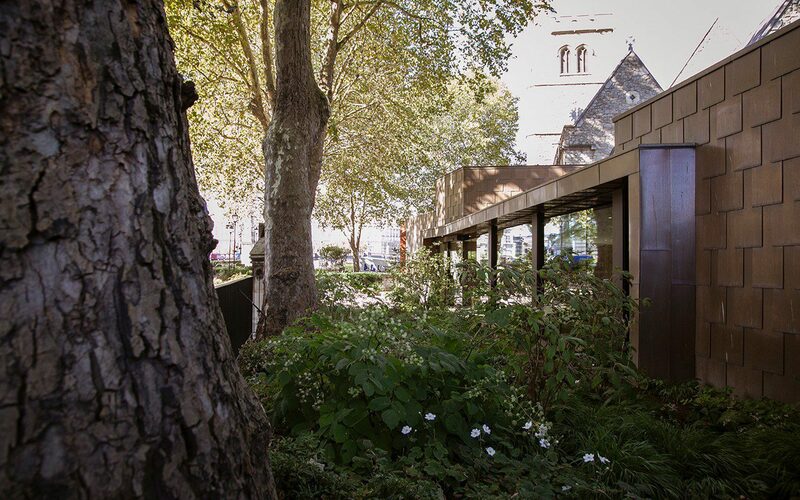 The street-side plane trees, which are protected and provide the museum with its leafy, woodland feeling, were able to have the building so close thanks to a piling system which floats the extension carefully over their root plates. 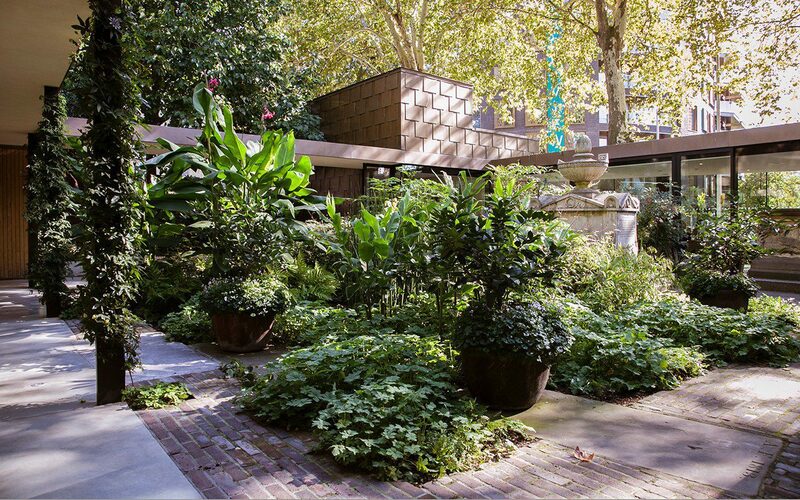 Viewed from four sides (through glass on three and an open, covered walkway on the fourth) the courtyard garden – called the Sackler Garden after a generous donation from the Sackler Foundation – would become a point of focus within the cloistered enclosure. The new glazed walls would also enhance the London microclimate and help buffer the garden from the wind that uses the River Thames as a corridor in this location. With the exploits of the Tradescants as inspiration, it was a small step to imagine this courtyard as a giant Wardian case – an aquarium-like structure invented in the 19th century to transport exotic and delicate new plant discoveries long distances by sea in a protected environment. The glassy cloister, our metaphorical Wardian case, allowed us to present a garden of curiosities and treasures. Though an oasis, as a space it is far from hermetic. 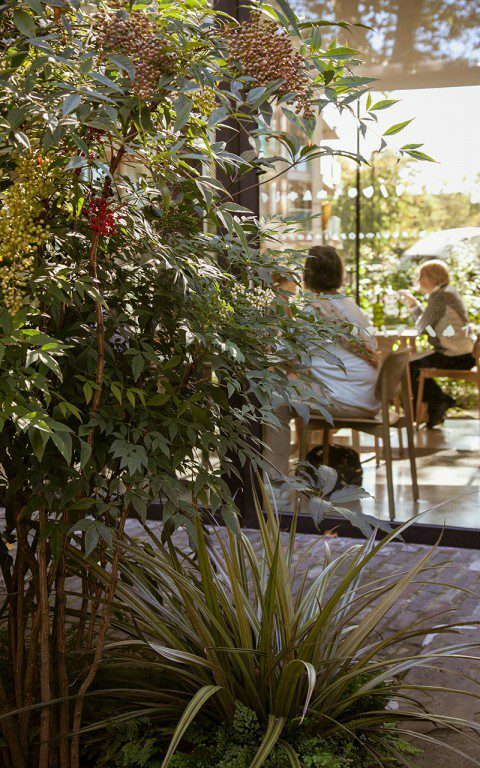 The planting continues on the street side of the café beneath the planes with a shady carpet of hardy evergreens and woodlanders including Hakonechloa macra and Epimedium sulphureum. A specimen Euonymus planipes was planted to frame the cafeteria door and emerging perennials such as Danae racemosa, Aralia cordata and white persicaria and wind anemone provide the planting with seasonal flux and help make the connection to the green world within. 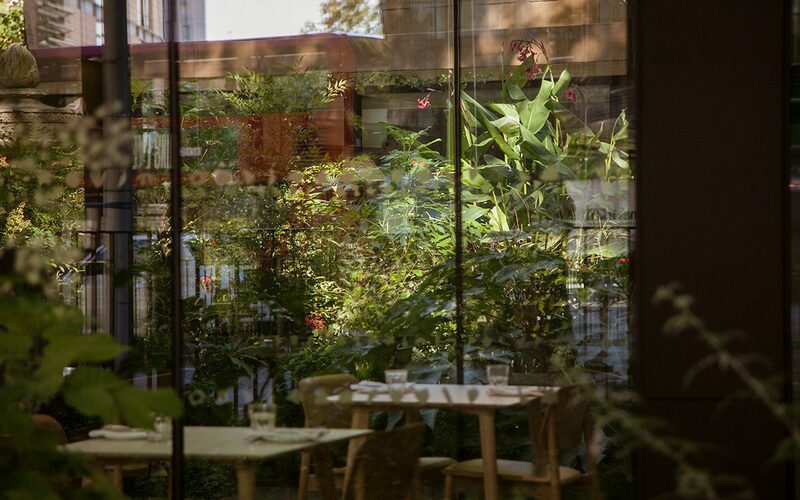 From the street the transparent walls of the café allow an intriguing glimpse of the jungly courtyard planting. As the courtyard is a deliberately acute focus, it was important that it be a dynamic space that works on every day of the year. When choosing the plants, I felt it was important to continue the spirit of discovery exemplified by the Tradescants and for the plants to tell a story of horticultural history. I also wanted the composition and plant choices to capture the magic of an 18th century botanical engraving and key into the gothic mood of the churchyard and its tombstones. Modern day plant hunters, such as Sue and Bleddyn Wynn-Jones of Crûg Farm Plants helped provide us with some of the curiosities. 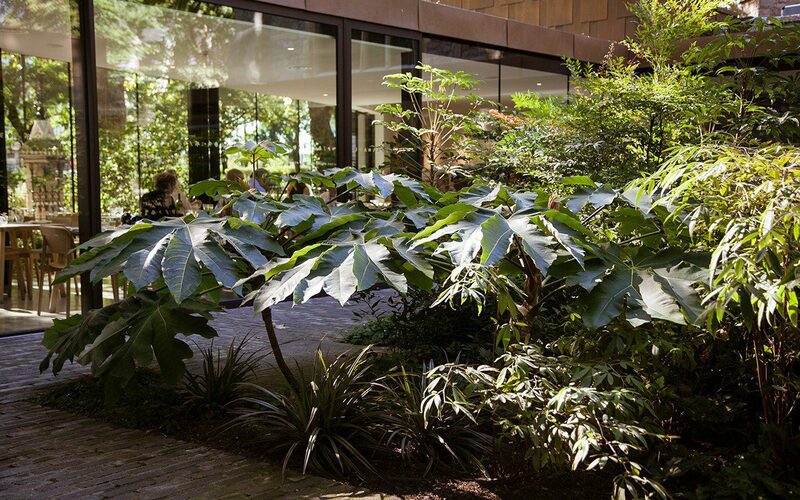 Fatsia polycarpa, a rarely seen castor oil plant with deeply divided, elegant fingered foliage, and a Schefflera from Taiwan, complete with precise location notes to bring their provenance to life. Nick Macer of Pan-Global Plants also provided us with some of his wild collections. A giant foliage Dahlia from a trip to Mexico, and flowering gingers for points of exotic interest. 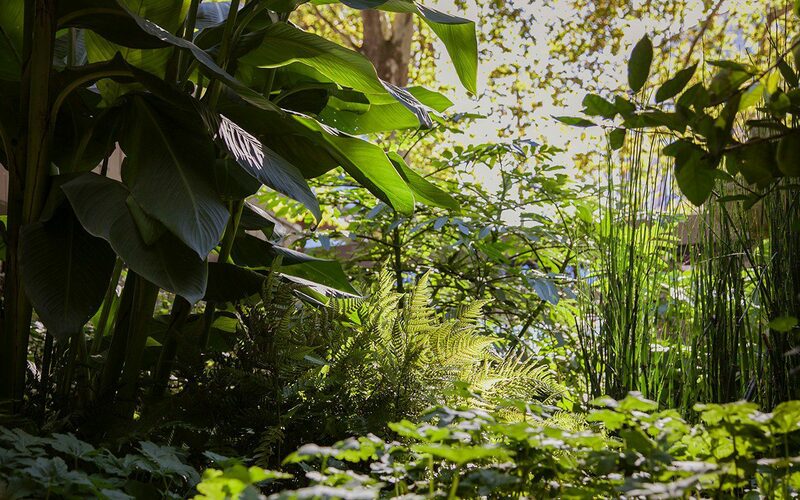 I wanted the planting to feel eclectic – a collection – and the exotic edge was important to conjure the feeling of awe and wonder that must be felt by all plant hunters. 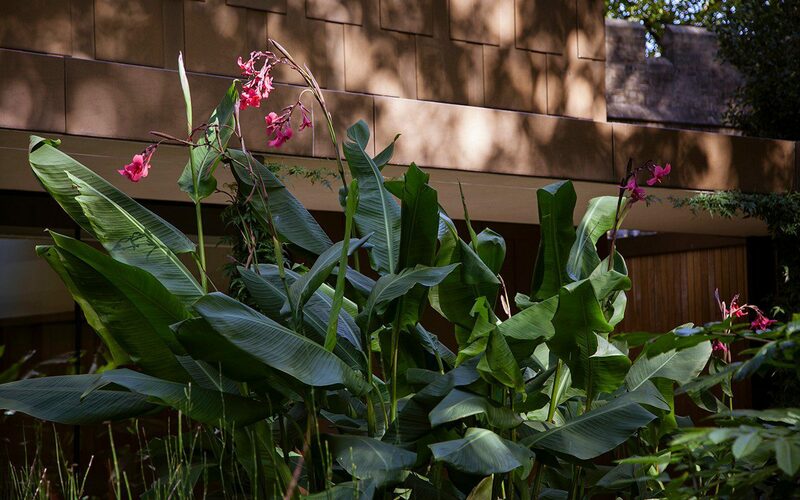 Canna x ehmannii and Tetrapanax papyrifer have done this at scale and made an immediate impact, whilst more demure curiosities such as Disporum cantoniense ‘Night Heron’ and Epimedium washunense ‘Caramel’ provide the detail once you start to look deeper. 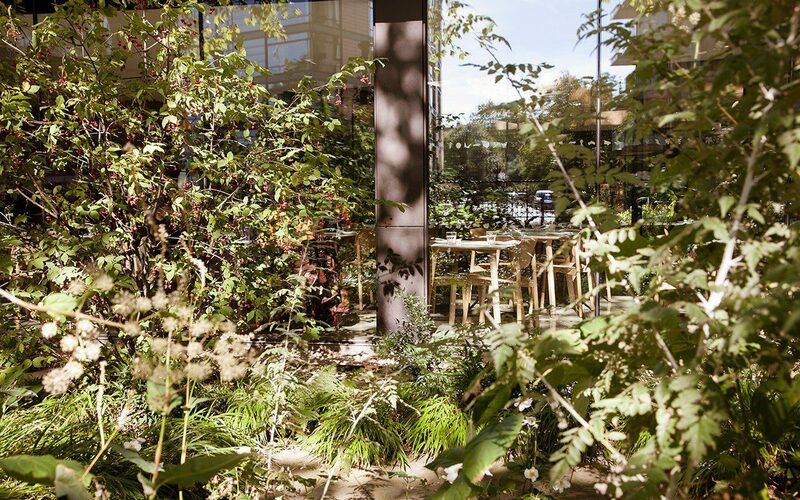 It was of prime importance to the museum that the garden provided a centre of horticultural excellence and the planting has been layered to create an ecosystem where each component in the composition provides a microclimate for its neighbours. The layering has also allowed the play of form and texture to work in combination and, importantly, for the sequencing over the course of the year to reveal change so that the garden is different each time that you visit. The layered planting includes, from left, Canna x ehemannii, Dryopteris erythrosora and Equisetum hyemale. Behind is a seed-collected species Dahlia from Pan-Global Plants. 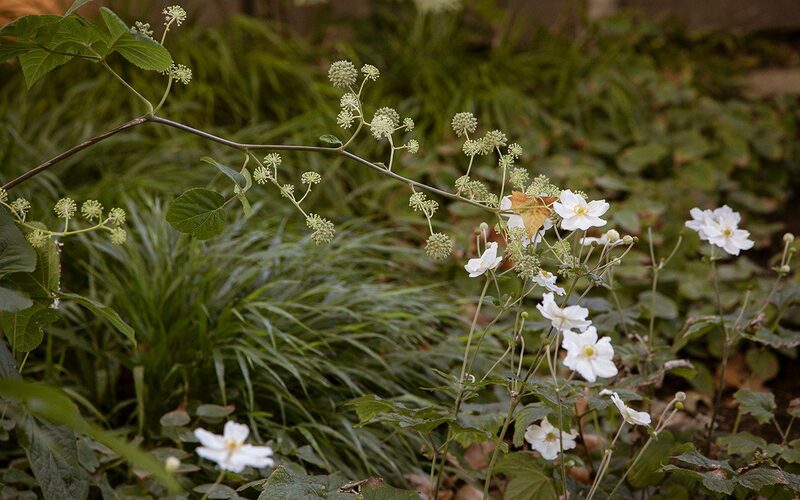 The groundcover is Geranium maccrorhizum ‘White Ness’, a 20th century discovery. 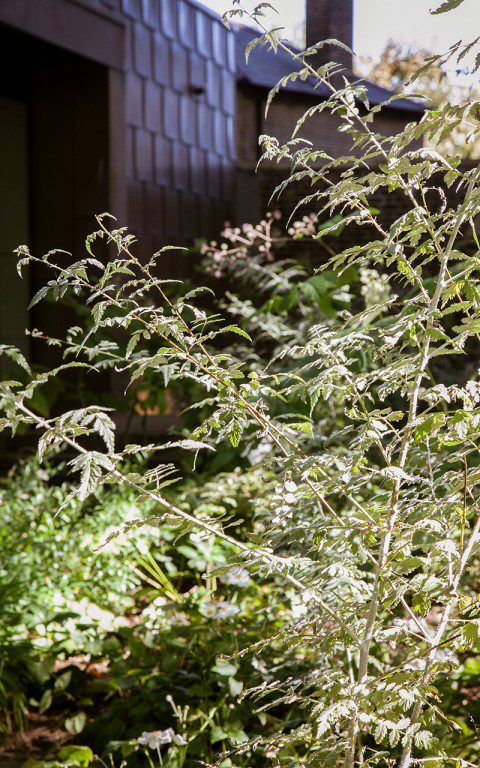 Nandina domestica has been planted around the tombstones to reflect its auspicious use as a welcome plant in China, but look carefully and in amongst its stems, like the layers in a rainforest, there is a mingling. Pewter Astelias from the Chatham Islands, delicate maidenhair ferns, the Australian violet, Viola hederacea, and black-leaved Ophiopogon nigrescens in their shadows. I wanted the garden to have plants that had a recognisable use amongst the curiosities too. Wild strawberries, that once would have grown locally in Lambeth, alongside Meyer lemons and passionfruit to remind us how we too often take the provenance of our food for granted. Having just completed its second summer, the garden is settling in and taking shape in the careful hand of Matt Collins, the museum’s head gardener, a horticultural trainee and a number of volunteers. A planting of deliberate complexity needs a well-informed eye to keep it looking good and it is a delight to return and to see it evolving. The potentially invasive Equisetum hyemale is kept in check and in its place to score its vivid green vertical and exotic climbers scale the cloister pillars. It has been a privilege to be part of this exciting new chapter and now also to help in developing the next. On Thursday this week the Garden Museum announced Lambeth Green, a new initiative to turn St. Mary’s Gardens alongside the Museum into a community hub, a village green for Lambeth, and also to reach its green tentacles further out into the streets to reconnect to the river and nearby Old Paradise Gardens. With the new incarnation of the Museum as a catalyst, it is now easy to see these exciting possibilities being realised.